This is my first post for my new position as the newest team member here at Art With No Boundaries. The challenge for the next two weeks is Anything Goes & Summer Skies. If you choose to create something depicting Summer Skies in some way you will be entering the Bonus Round for the prize. Please put BR after your name when you do that so you won't miss out on a chance to win a design from Chris at CS Designs. Chris is a very forward thinking designer and has some very unique designs. For my project I used Chris's design Cosmo Wide Panel. She looked very dreamy to me, hence the title of my post. I stamped the flourishes on the card and yellow card stock with VersaMark ink, colored Cosmo with Copic Markers, added the little jewels to her stars, and dyed the seam binding to match the card and created the bow. I hope you click over to Art With No Boundaries and check out what the other team members have created and that we all have inspired you to created something with a Summer Skies theme or just create something and come over and join in on the fun. Bev...welcome to the team and congrats on a fabulous project for your first post. She is beautifully coloured. Great idea to do the Versamark swirls on the background. She looks dreamy, indeed. 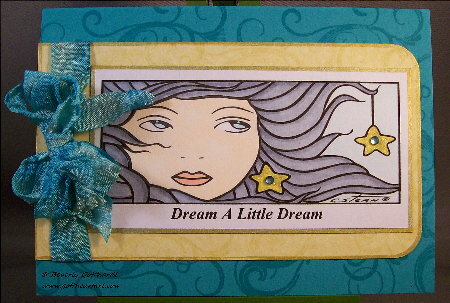 Love the background flourishes and the "dream a little dream." Your card is lovely! And a big welcome to you! Once again welcome to the team! I love the way you have coloured Cosmo, the swirls in the background and the ribbon Beautiful!!! A big congrats on your new dt gig at Art with No Boundaries! Great work, as always, Bev!